Rohit Sharma and Shikhar Dhawan were in full flow during the 4th ODI against Australia played at PCA Stadium, Mohali on Sunday. They became the 2nd most successful pair for India in ODIs, surpassing the record of Sachin Tendulkar and Virender Sehwag. 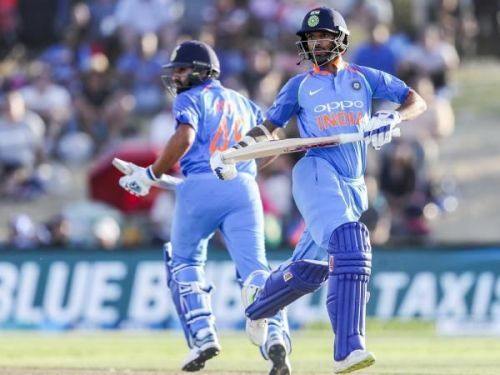 Shikhar Dhawan came back to form with his career-best score of 143 runs, while Rohit Sharma made 95, with the pair putting on 193 runs for the opening wicket and thereby setting the foundation for a big total. India posted 358-9 in 50 overs. Despite their efforts, Australia chased down this big target with 4 wickets remaining and 13 balls to spare. Dhawan and Rohit Sharma became the second most successful one-day pair for India. Both explosive openers now have 4571 runs from 102 innings. They surpassed the record of Sachin Tendulkar and Virender Sehwag. They scored a total of 8227 runs in 176 innings at an average of 39.16. Sehwag and Tendulkar are now third on the list with 4387 runs in 114 innings, as the present opening pair has mustered 15 100+ opening stands in ODIs, just six behind Ganguly and Tendulkar (21). They are also just one behind Adam Gilchrist and Matthew Hayden, who enjoyed 16 century stands. Both openers took on Australian bowlers and showed why they are the best ODI pair in modern-day ODI cricket. They now have 15 100-run partnerships in one-day internationals. Presently, the pair are tied with G Greendidge and Desmond Haynes, who also recorded 15 100-plus run partnerships. Shikhar Dhawan's world-class knock of 143 included 18 boundaries and three maximums, while Rohit Sharma fell just short of his century. He struck seven fours and two sixes. However, a late flourish from Ashton Turner steered Australia to victory, after Peter Handscomb had earlier registered a crucial 117. India's opening combination - an issue that needs to be addressed?